In the Volunteer Spotlight for April 2019: Jim Deal! 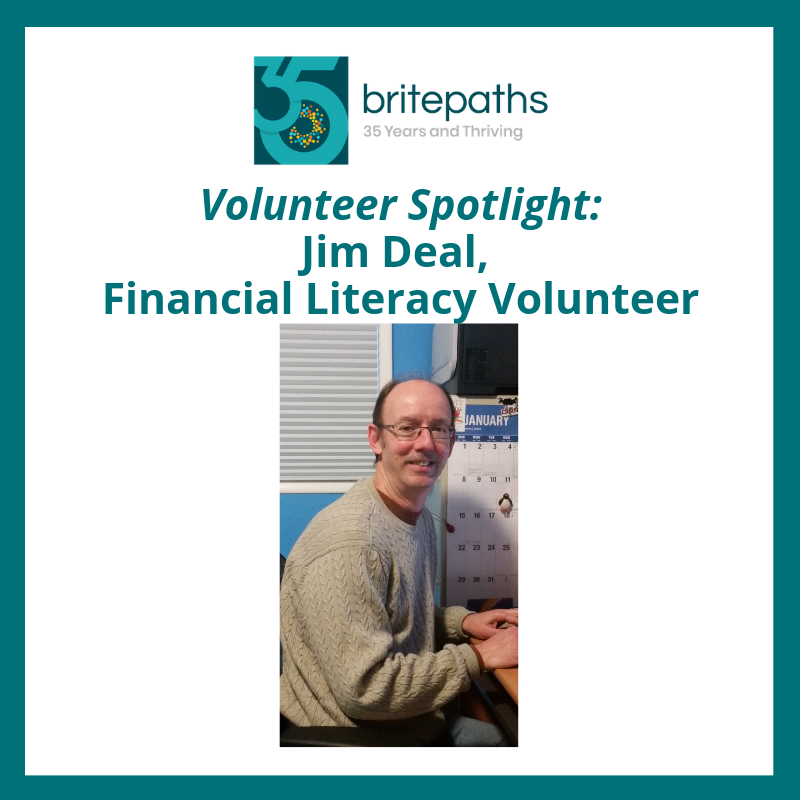 Jim joined Britepaths in 2010 as a Financial Mentor. His mentoring experience inspired him to develop a program called JUMP to help clients track their daily expenses so that when they were matched to a Mentor, they would be better prepared to develop their budget and savings goals. A client who went through the JUMP program wrote this thank you to Jim, "I can’t thank you enough for all you’ve shown me, helped me work through and coming up with avenues to help get me on the right path. It has been a true pleasure and I don’t think I could’ve cured or fixed things on my own. Just the realization of what’s been going out by sending you daily texts has really opened my eyes to some of the unnecessary spending that we can easily fall into. You have done wonders for me and made me feel like I had support in my goals. Just by you having me make a few changes in my spending, feeling motivated to get a second job, and realizing how I had lost track of things by using autopay too much. It’s made a huge impact." In 2018, Jim gave more than 400 hours of his time to help clients help themselves on the path to self-sufficiency. We estimate that in his years at Britepaths, he has volunteered approximately 1,500 hours. Recently, Jim started volunteering with our Food Bridge Program to run errands for us as needed, and it has been such a great help to our staff. We nominated Jim for a Volunteer Fairfax Volunteer Service Award, and we're looking forward to celebrating with him and our region's other amazing volunteers on April 24, 2019. Please join us in thanking Jim for his outstanding service to our families and our staff.